Workshop Theatre. 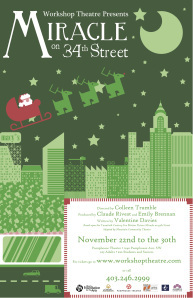 One of their upcoming productions is the classic “Miracle on 34th Street”. They needed some child extras and she auditioned and got a small walk-on part. Now I am sure you are thinking it… Stage Mom. No, I am not. I truly believe that you should expose your child to many different kinds of experiences and to share your passions. One of my passions (and part-time occupations) happens to be theatre. I have been involved with theatre since I was in high school. It was something I fell into after my short run as a figure skater. After I quit skating (another passion), I was looking for a new passion or interest. I was not really into sports as a kid and was always involved in music. One of the music teachers in the small town that I grew up in would put on musicals. Needless to say, I got hooked. As a natural introvert, acting and performing on stage made me feel confident. I appreciated the entire process of putting on a play. Being involved with a band of theatre people made me feel unique and different. In a small town where sports seemed to be king, being a drama geek somehow empowered me. I was not like everyone else. I was different. So, will I be a stage mom? Sure. I will also be a soccer mom, a martial arts mom, a figure skater mom, a snowboarder mom maybe even a hockey mom. I’ll be whatever mom that my kid wants me to be. There are many lifelong skills that you can gain in theatre and she can gain confidence. I happen to be involved with theatre. I want her to see me be involved with something that makes me happy. There are many other passions that I enjoy and I hope to get her involved with those as well. My husband has a passion for martial arts and guess what she will start as soon as she is old enough. I discovered a great little Mexican food store called Tres Marias in Marda Loop here in Calgary. It is next to Vanessa’s music school. They have amazing salsas and the mole is to die for! They make all their products from scratch and they serve lunch items and have a small seating area. I have been having their burrittos while I wait for Vanessa on Saturday afternoons. More date nights! We have been trying to go on more date nights in the last couple of months. In October we went out to National on 17th Avenue twice! Yes, we like that place that much. Their cocktails are very good. I recommend the “Hound Dog Hooch” and I think they make the best poutine in the city. I recommend the duck poutine — very decadent. My husband loves the beer selection, of course. Another place that we went to for date night was Kensington Pub in our ‘hood’. This is a great little place to go to when it’s cold outside. You do feel like you’re stepping into an English pub when you arrive. I recommend the shepherds pie – very traditional and made with lamb. We often like to stick to our neighbourhood because then we don’t have to have the hassle of driving across the city. Another local find is Brasserie Kensington. Again my husband likes it because of the excellent beer selection (as long as he has beer he’s happy). The saffron cream mussles are very good and you can use the pommes frittes to soak up all the delicious juices. Yum! 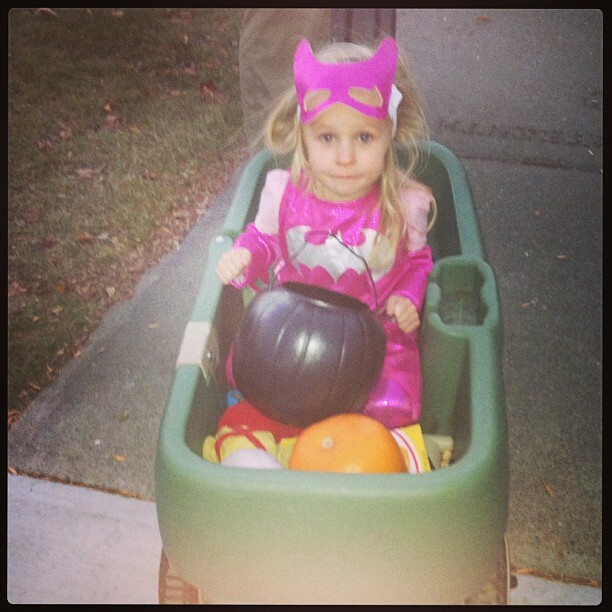 Bat girl in the wagon looking for treats! kids around the neighbourhood which is very cool to see. There were people sitting outside of their doors drinking wine around fire pits welcoming everyone that came by for treats. We were even offered mulberry wine! (Parents need treats too!) The neighours are very friendly and inviting during Halloween. There was a great article I found online about Canada’s greatest neighbourhoods and Kensington was listed as one of them. No surprise, really.